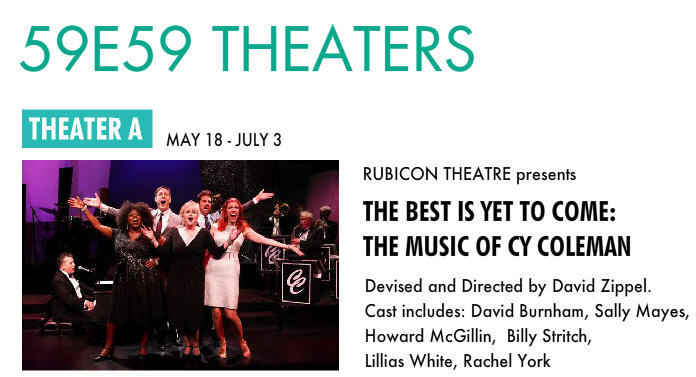 Last Friday night, Noah and I went to see The Best Is Yet To Come: The Music of Cy Coleman at 59 E 59 Theater. It was some of the most fun I've had at a performance. It's an 85 solid minutes of a fun-packed revue of the music of Cy Coleman. The only thing missing was a dance floor and a martini. The cast is David Burnham, Howard McGillin, Billy Stritch, Lillias White, Rachel York and Sally Mayes. The evening we were there, Sally was out and Natascia Diaz was in. Cy Coleman, a composer, songwriter, and jazz pianist, wrote the music for the Broadway musicals Sweet Charity, Seesaw, On the Twentieth Century, Barnum, City of Angels, The Will Rogers Follies, and The Life, as well as for numerous plays and movies. While there is choreography and a little bit of "acting," it's mostly just a song tribute to Cy's music. With Billy Stritch at the grand piano and a big band backing them up, it feels very elegant and stylish - a throw-back to the 1940s. The songs set is comprised of recognizable standards - obviously, The Best is Yet to Come made famous by Sinatra - and his theatre songs. Lillias White stole the evening with her rendition of "The Oldest Profession" from The Life, which won her the 1997 Tony Award for Best Feature Actress in a Musical. It was also thrilling hearing Natascia perform "Nobody Does It Like Me" from Seesaw and made me hope for an Encores! production of this show for her to star in. The finale was a "megamix" that blew the roof off. I found it impossible to sit still in my seat and I think my fellow audience members were experiencing the same sensation. It was a total blast! The show runs through July 3rd at 59 E 59.